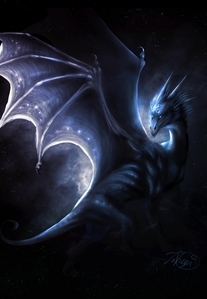 If u were a dragon how would u look(as in colour/abilities/size/ect.)? u a Michael Jackson fan too? 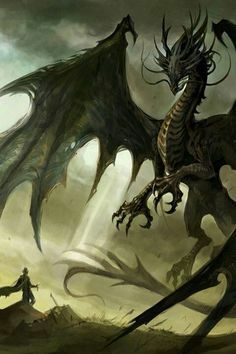 I'd look like the dragon in this picture, and I'd have an anti-hero personality(just like I currently have) and razor-sharp claws and teeth, and have the power to shoot hot plasma (yeah, I know it sounds farfetched for a dragon, but come on!) out of my mouth. 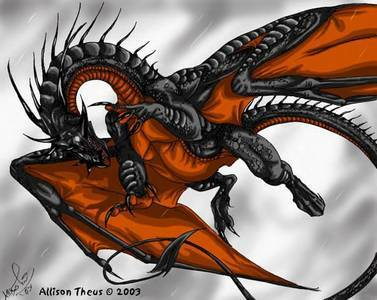 I'd be a dragon like this with fur! With a pretty white and blue combination like so. I'd also be able to change size and be a shoulder pet if I wanted. I'd say I wouldn't be very mean actually unless I was protecting someone of something. Not all humans are bad after all. I'd also have the ability to detect forms of life around me through any barrier. :3 My abilities are meer defensive I suppose than offensive XD. 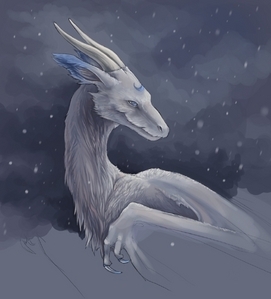 i would be an ice dragon and look like this one, but meer cyan. I would be a blue dragon. I'd have big wings, sharp teeth, blue eyes. 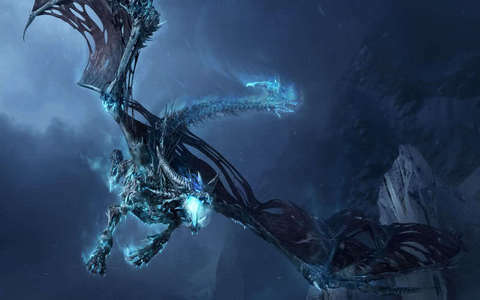 So pretty much an ice dragon. Okay, u see the little dragon door his head. 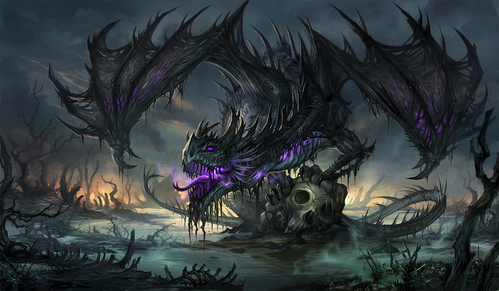 That is how my dragon pretty much looks. It will have the ability to change it's size, it can stay that small of it can grow big enough for a person to ride. It's apperance changes when it goes into it's full size (too lazy to describe how it looks). Grows very strong attachments to it's vrienden and protects them at all costs. Has many abilities. Can breath fire, ice, poison, fog. Has a little bit of magical capabilities, u know can sing a song that will heal any injury, a song that can put someone to sleep, song magic I guess. DAWWW ^_^ It's so cute! Now that I think about it the 'poison breath' thing sounds stupid, so I think I'm going to get rid of it. I would be an opalescent cobalt blue with purple accents. I would breath brand and be telepathic. My tail would be powerful enough to kill an elephant. My talons would be stronger than steel and sharper than obsidian. My eyes would be smaragd, emerald green. It would take a soul bonding before I would allow anyone to ride me, I would be fiercely loyal to those I trusted. In my fantasies I am a goud Dragon. In fact instead of having a name I am simply referred to as the Golden Dragon of The Golden One. I look exactly like Gladyr only with all 4 legs. My scales are indestructible including my stomach unless the weapon had extremely powerful magical attributes. 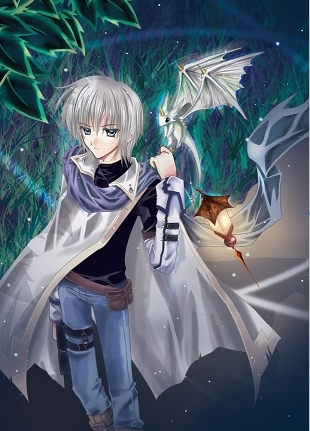 I have every ability every dragon in the following stories have (Eragon, Dragon Booster, Spyro, How to Train Your Dragon (movie and tv toon NOT books)) and I am 10 times meer powerful in the force than Yoda and I can fight with 4 keyblades (See Kingdom Hearts) as the last survivor of the keyblade wars. Oh, if I deem a being noble and pure enough I give them a choice of becoming a dragon that best fits their personality (I turned Hiccup into a Night Fury and Arther Penn into Bo's type and his vrienden into the types of dragons they ride-Dragon Booster show). As for my size I can grow and shrink anywhere from hatchling size (about the size of a terrible terror from How to Train Your Dragon) to the size of a mountain. However the bigger and/or meer powerful I get, the longer it takes for me to recharge and until them I'm a useless defenseless hatchling sized dragon. Everyone please emai me your answers, it might give me new character ideas for my fantasies. 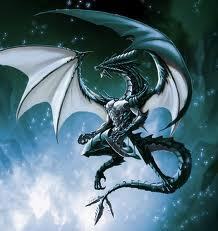 Lastly, I would be mated to Saphira. Huge. Black. Eerie. Covered in spikes. This badass...colossal...powerful...absolutely unmatched door any other creature. like the one xxtaysuicunexx posted, but with red eyes that can force all opponents to back down. 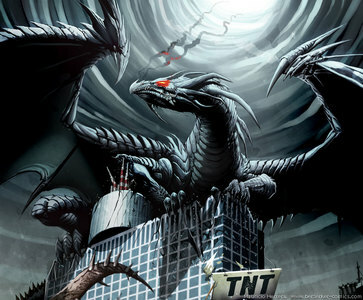 colossal sized, silver and black with, molten mercury eyes, spikes down the long neck and back, four limbs with extremely sharp claws on the hands and feet, wings with sharp claws on the tips extending from the back, long tail with sharp battle ax like end that is capable of folding up to a pointed tail. capable of breathing fire, ice, lightning, corrosive gas, acid,and force. capable of flight digging underground swimming in the water. immune to all but the highest level of magic and most physical attacks capable of using magic at the highest level both for offence and defence. all but immortal life span have to be killed to die. Colour: Black with soft turquoise iridescent markings mainly on the back, legs and neck. taling, groenblauw iridescent markings on the wings. Eyes: Red, goud of white. Scales, vacht, bont of feathers? : Scales with a little lining of feathers on the tips of the wing. Abilities: Able to reach 80 mph in 3 seconds, fly at about 150 mph without consequences, mimic sounds, speak and understand languages after being taught them and able to make a home pagina from own body slime and the like (like a Xenomorth a little). 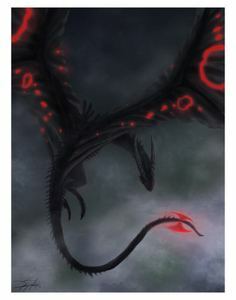 a HUGE black dragon, with wings as big as the sky. 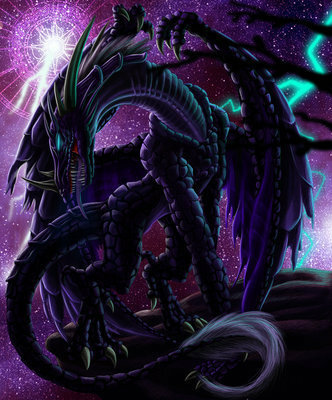 I would be the alpha of all dragons. 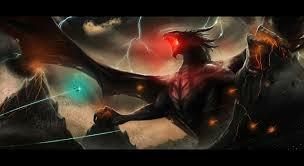 like in this exact photo, but what u see as the man is what people would consider BIG dragons.